The National Bank of Ukraine issued into circulation the commemorative coin “Wolf” of 5 hryvnia face value on 9th of November 2016. 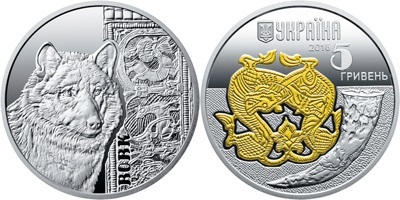 Coin issued under new coin series Fauna in Cultural Monuments of Ukraine. The coin of 5 hryvnia face value has been made of silver; quality – “BU”, weight in fineness – 15.55 g, diameter – 33 mm, mintage – 4 000 pieces. The coin edge is smooth with in-depth legends: Ag 925 (metal and fineness), 15.55 (weight in fineness), NBU Mint logo. The commemorative coins are a legal tender of Ukraine and shall be accepted without any restrictions at their face values for all types of payments as well as for placing to the settlement accounts, on deposits, for letters of credit and transfers.